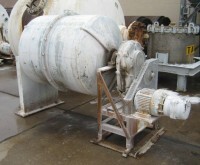 1/2 liter Drais Mannheim Lab Perl Media Mill. 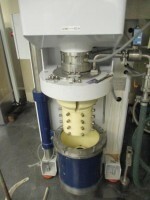 1 gallon Union Process Attritor, stainless steel bowl and shaft. 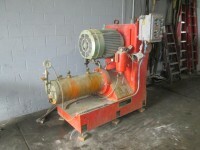 1S Union Process Attritor, Type B, 1/2 hp US Varidrive. 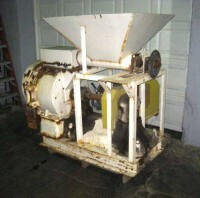 used Mikropul Pulverizer, Model SH. 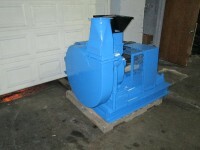 used 5 hp Mikropul Pulverizer, Model 1W. 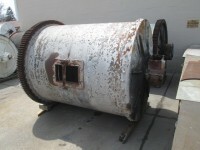 Schutz O'Neill Air Swept Pulverizer, Model 20, 40 hp. 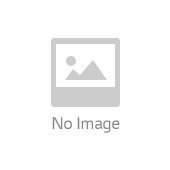 4TH Pulva Rotor with bearings. 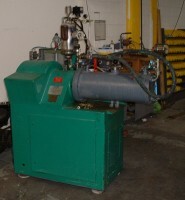 Angstrom Grinding Chamber and puck. 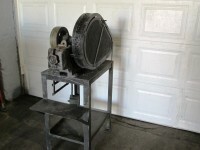 20 Liter Netzsch Media Mill, molinex style, 25 hp vari speed. 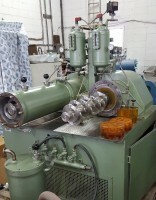 45 liter Netzsch Horizontal Media Mill, 50 hp. 45 liter Ross Horiz. 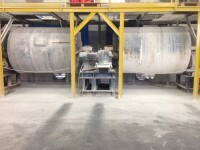 Media Mill, jacketed & stainless steel chamber. Abbe Eng. 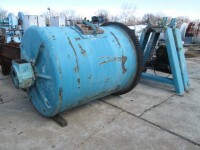 Jar Roller Mill, 3" x 48" rolls, single tier. 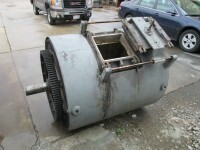 Jar Roller Mill, 5" x 48" long rolls, single tier. 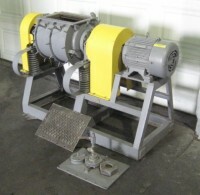 3" x 4" Abbe Engineering Jaw Crusher, 1 hp. 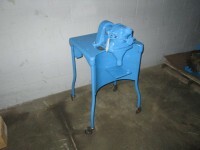 2.5" x 4" Lab Jaw Crusher, 2 hp. 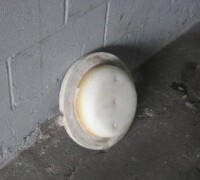 21" x 17" Patterson Pebble Mill, ceramic chamber. Paul O. Abbe Pebble Mill, 3 hp, alumina brick lined. 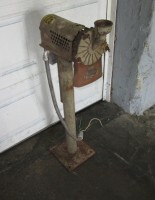 42" x 48" long Pebble Mill, 5 hp gear reduced drive, on stand. 42" x 48" Paul O. Abbe Pebble Mill. 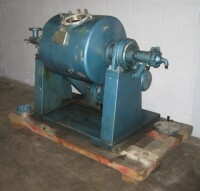 4' x 4' Paul O. Abbe Pebble Mill, 10 hp motor. 5' x 6' Patterson Pebble Mill, alumina brick lined. 5' x 6' Patterson Pebble Mill, aluminia brick lining. 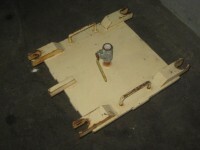 80" x 72" Netzsch Pebble Mill. alumina brick lined. 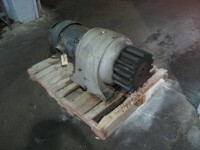 20 hp Sterling Gear Reduced Drive, 100 rpm output. Pebble Mill Door, alumina brick lined. 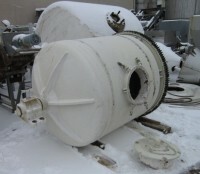 one(1) used Ball Mill door, Grinding door, 9" x 15.5"
Ball Mill Discharge Door. 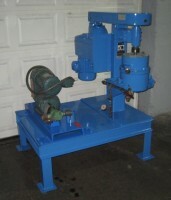 9" x 15.5"
4" x 8" Lehman Three Roll Mill. 14" x 30" J.H. 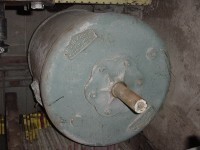 Day Three Roll Mill, 2 speed motor. Bronze End Guides for a 12" diameter Three Roll Mill. Apron Hooks for J.H. Day Three Roll Mill, one set. 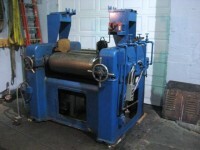 Reliable Two Roll Mill, 18" x 18" x 48" long, cored rolls.